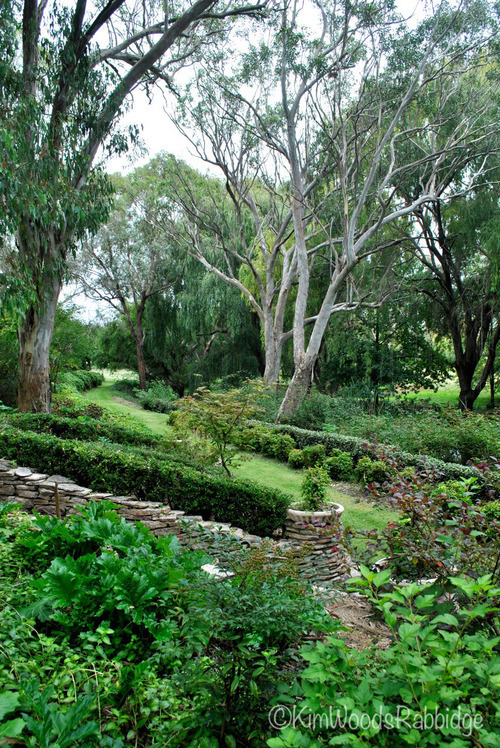 Glenrock, once voted Australia’s best garden, is one of two major landscapes Carolyn Robinson has transformed around her own homes. 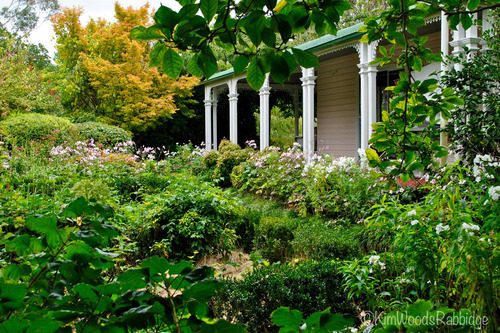 Both gardens are just outside Tenterfield, in the Northern Tablelands of New South Wales and, while very different, they exhibit all the hallmarks of this talented plantswoman. 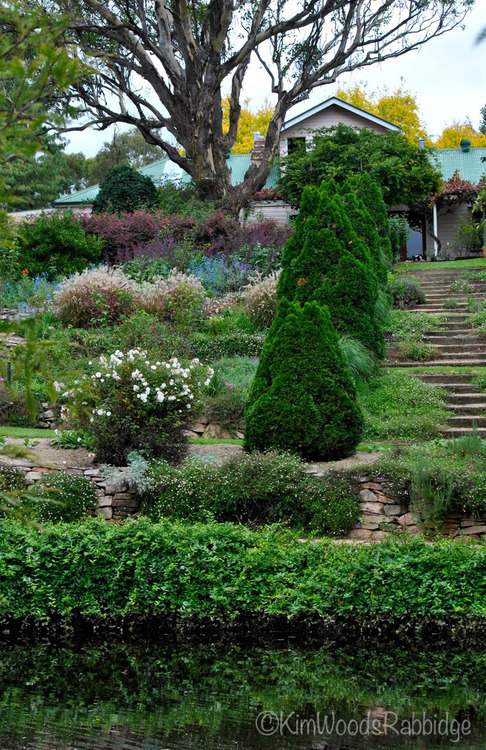 We’ll show you Carolyn’s exciting new garden Eagles’ Bluff in a future post, but right now we’re celebrating Glenrock, which is still the primary residence of Carolyn and her husband Peter. 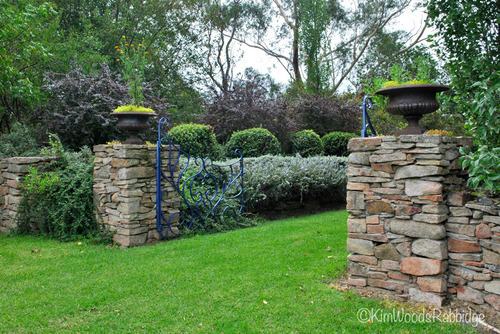 From the stone entry pillars, (Carolyn says her fingers were itching to begin the rockwork) her renown skill with plant and colour combinations draws visitors to stroll leisurely and take in all the details. Eucalyptus amplifolia, known as the cabbage gum, stands sentinel above several Thuja occidentalis ‘smaragd’ conifers lined up beside the generous stairs leading down through the terraces. 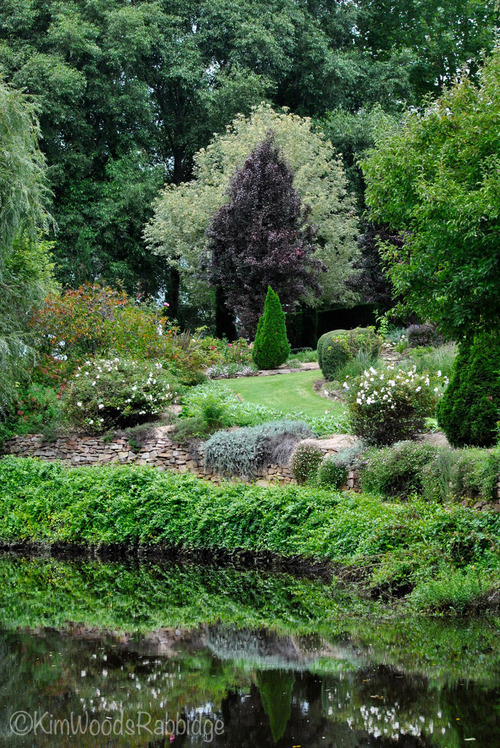 The house sits on a high ridge above terraces running parallel to the water course, which is the heart of the garden. 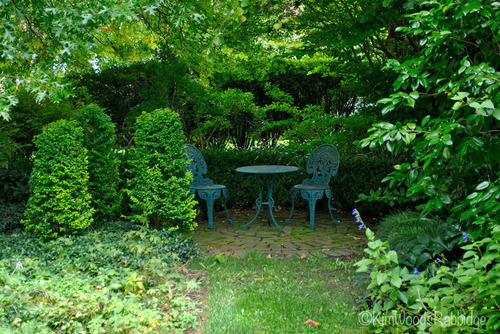 As the garden has aged there are few spaces unaffected by tree roots and shade. However this now-mature garden benefits from years of mulching and soil improvement and is a lot less work than in the early years. 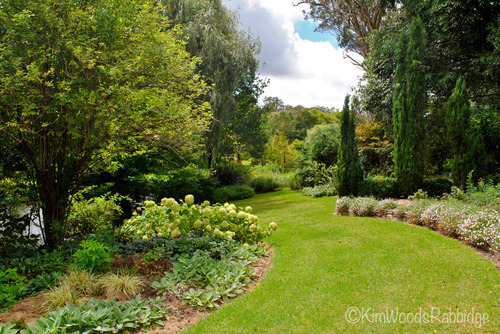 Always evolving: around the home, perennials revel in the sunlight after two huge eucalypts were removed for safety reasons. Pink anemones flower after a cool summer in which good late January rain followed a very dry spell. The garden has only been watered two or three times this season, instead of two to three times a month in dry years. Canada red oak (Quercus rubra) on the left is yet to colour, while the Robinia pseudoacacia ’Frisia’ is already a golden yellow, and highlights the Prunus nigra ‘Fastigiata’. 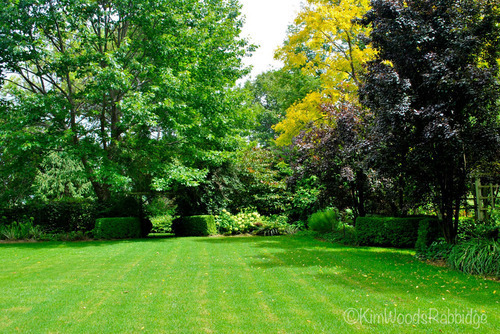 On the southern side of the house the croquet lawn is a quiet expanse that’s a perfect foil for abundant gardens. 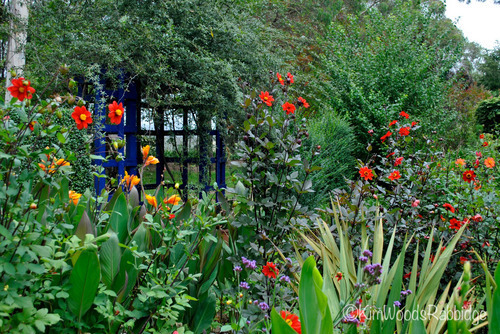 Behind the immaculately trimmed privet hedges, a grass path divides deep borders filled with cannas in reds and pinks, iris, autumn-flowering dahlias, and clouds of blue bog sage. 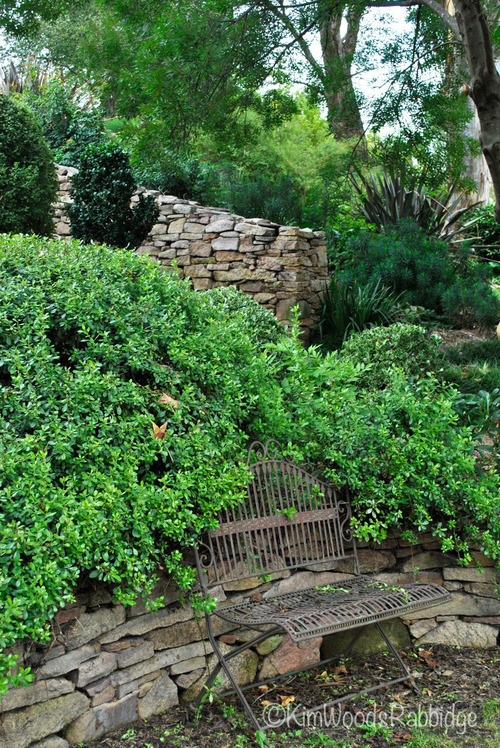 Carolyn’s tip: The roots from the privet hedges are contained by clumping roots of grasses grown as vertical highlights at the back of the borders. 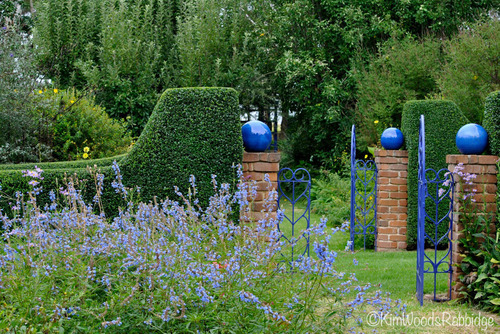 Garden structures are highlighted with signature bold blue that’s a counterpoint for lush greens and diverse colours. 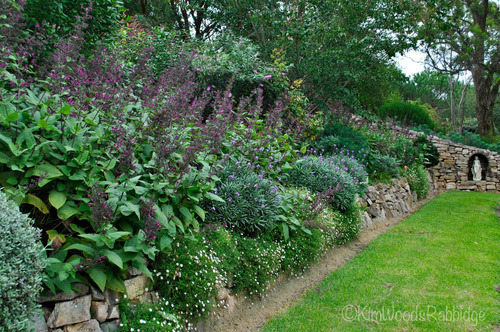 Spires of Lepechinia salviae accompany mounds of wall flowers and seaside daisies. The long terraces bordered by stone walls are exuberantly planted for seasonal interest. Stunning Eucalyptus blakelyi can be both a curse and a blessing. Carolyn despaired of ever being able to grow anything under them however once paths and rockwalls were complete, the planting took shape. 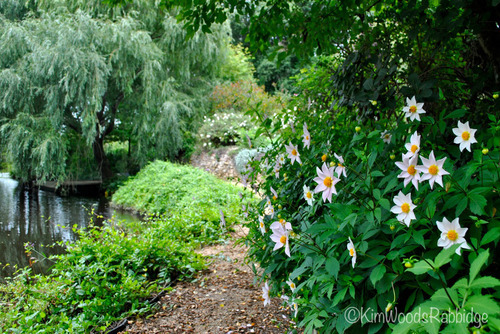 This dainty, single pink dahlia was a roadside rescue that has repaid the kindness by flourishing. Stacked local flat stone helps establish a sense of place. The stone occurs naturally as slabs flake off huge monoliths in heat and frost. Behind the water, edged by pickerel (Pontederia cordata), a low stone wall woven (during a six day extravaganza) by Carolyn and assistant Steve Green, defines the garden’s perimeter yet enables bucolic vistas to be appreciated. 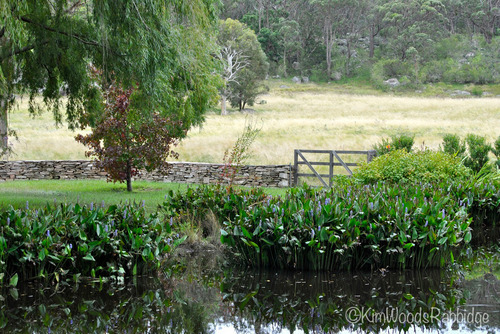 The paddock’s bareness hints at what the site was like before the garden was established – there wasn’t one tree along the water course. Acer negundo ‘Flamingo’ stands behind a Prunus nigra ‘Fastigiata’ and Thuja occidentalis ‘smaragd’. 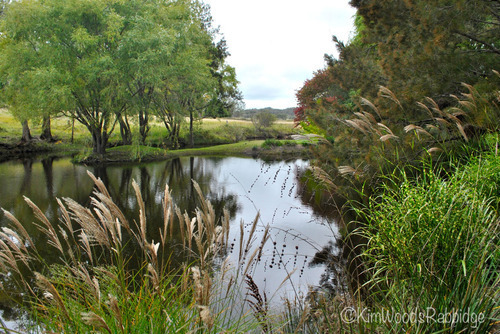 A dominant element: the water amplifies lush surrounds in its reflections. 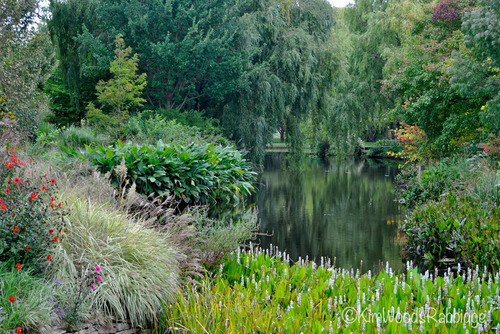 Miscanthus sinensis is a soft accent by the boardwalk and on the right, branches of a silk floss tree (Albizia julibrissin) hang elegantly over the water. 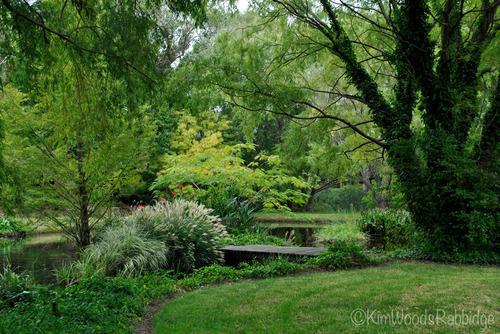 Bridges and lawn walkways intersecting the water ensure all the garden is accessible. In the distance a tulip tree (Liriodendron tulipifera) is already colouring but shortly the Nyssa sylvaticas, on either side of the lawn walk, will be ablaze! Water-loving thalia has lovely large leaves, yet delicate flowers at the end of long spires. 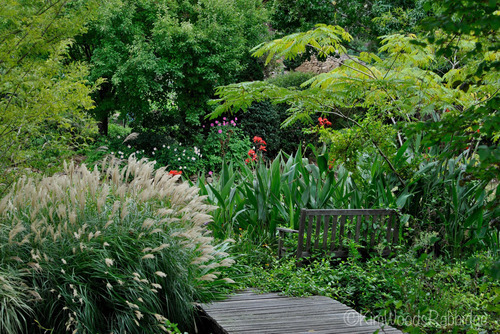 The garden is a refuge for local bird species – including myriad finches and wrens. Their constant sound and movement enlivens the mood of the garden. 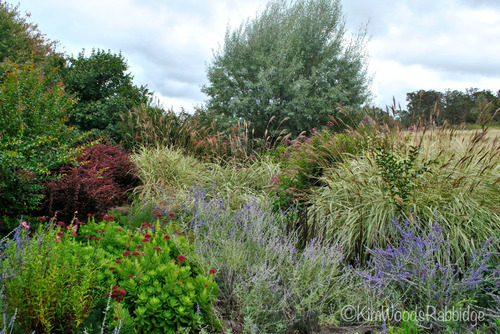 A jostle of plants include Russian sage, sedum ‘Autumn Joy’, Berberis thunbegii ‘Rose Glow’ and various miscanthus. At the back a rare silver willow was planted as a cutting from a roadside tree. 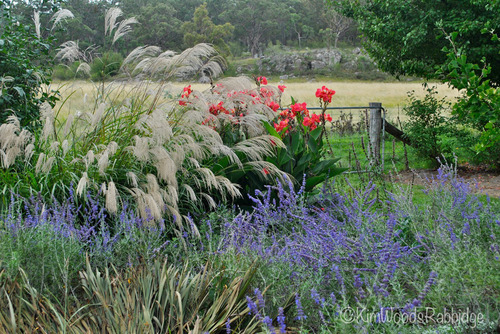 Some parts of the prairie style border garden are ten metres deep; however they don’t seem too wide once the large grasses are established says Carolyn. Miscanthus sinensis ‘Yakushima’ and M. sinensis ‘Zebrinus’ embrace the delicate wands of Dierama pulcherrimum – aka fairies’ fishing rods. Where ever humans garden magnificently, there is magnificent heartache. 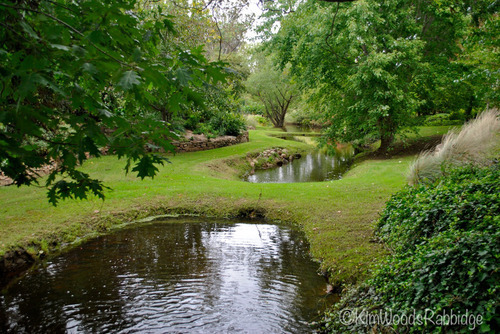 Heavy rainfall over the last few seasons has inundated lower sections of the gardens, turning the creek into a raging torrent and punching holes through rock walls. 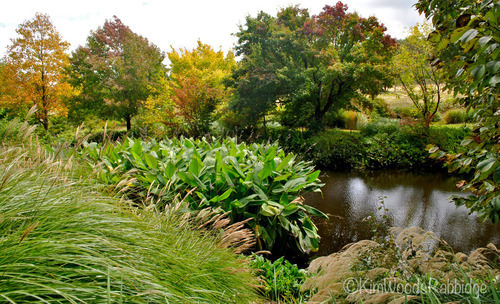 Plantings have helped stabilise many of the banks, minimising erosion. Buddleja davidii ‘Dartmoor’ makes a striking note overlooking the water. 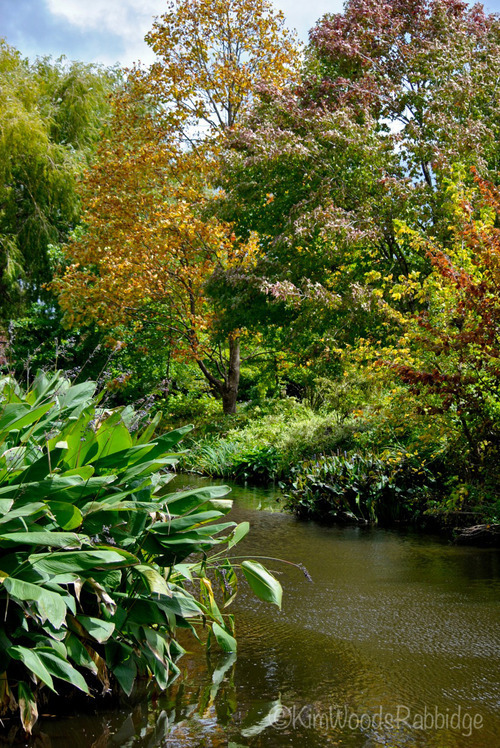 Carolyn’s decision to garden around the water course seems brave, however the benefits of the site are many, especially as water is so essential for maintaining the life of plants. 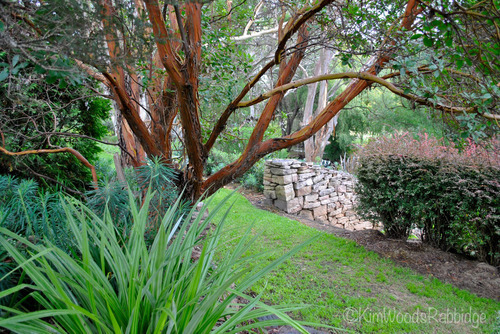 After Arbutus andrachnoides has flowered, its red bark is a highlight through autumn and winter. In the foreground a rare Chatham islands astella has lovely silvery, strappy leaves. Terraces open up to sunny expanses of lawn. Cream heads of hydrangea ‘Annabelle’ add textural highlights. 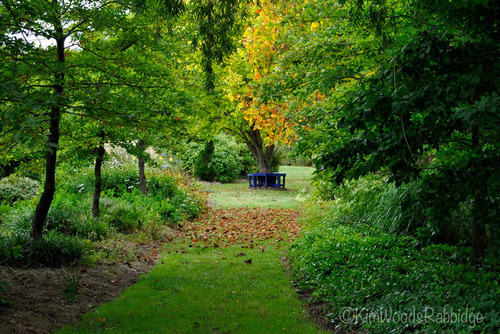 When establishing the garden, Carolyn raked up leaves and acorns from parks in Tenterfield and applied them as mulch. 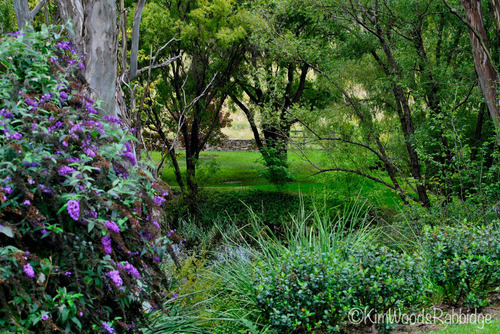 From small acorns mighty oaks grow… and now oak trees grow at Glenrock in a naturalistic way. 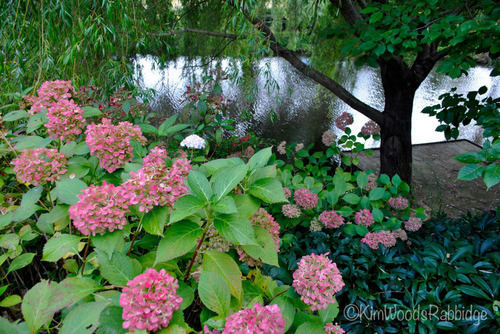 Hydrangeas bring joy through summer into autumn. Many of the unusual plants from her garden will soon be available online when her Blue Hills Nursery site is activated. 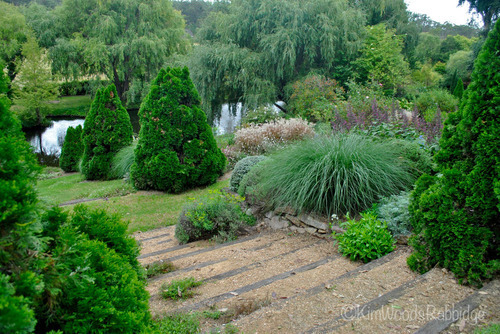 This is a generous, richly planted garden built by an inspiring gardener who shares her talents with not only New Englanders but also those from afar. Carolyn’s energy and knowledge, and her passion for the landscape, is legendary. Her new garden is totally different although she has once again responded to the natural landscape. Look out for our post on Eagles’ Bluff in a few weeks. We think you’ll like it! Love the quote from Henry Mitchell – too true. I think your photos, your concept and your work is brilliant. They give me hours of pleasure and absorption. Thank you. LOVE receiving your work. Love it. 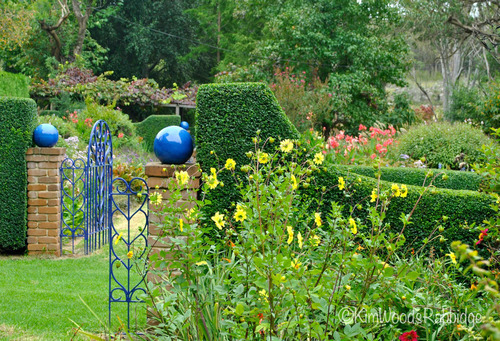 Carolyn’s garden is truly inspirational and a delight to visit. We have had the privilege of witnessing its creation, development and now its maturity over the last 15 years. 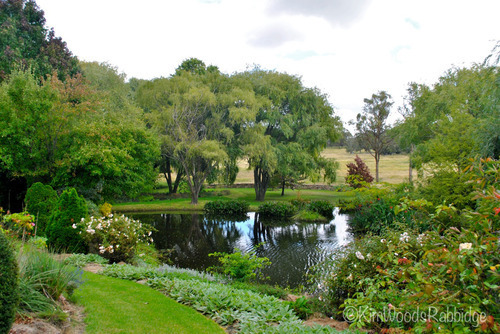 It surely is one of the most beautiful gardens in Australia; world class. Carolyn is definitely one of the garden designers of her generation. Thank you so much for bringing it to us in all its glory. I LOVE your garden site updates and beautiful photography. Thank you for refreshing my many fond memories of this gorgeous garden – which I have visited at least 3 times over the years but not recently. Sad to think Caroline (and her hubby) will be moving on soon – but I too know both the sadness of leaving something special you have shed blood, sweat and tears to create, as well as the pleasure to be had from starting anew and wish them the very best. Thanks for the memories! OAG: Thanks so much for your comments Rowena and we’re glad you’ve enjoyed revisiting Carolyn’s lovely garden. You’ll be pleased to know that Carolyn and Peter have no immediate plans to leave Glenrock now as she and her new business partner, who’s a horticulturalist, plan on propagating and selling many special plants through their Blue Hills online Nursery.